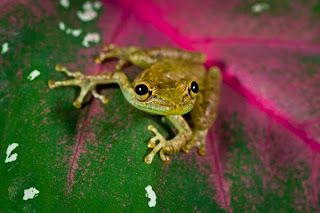 The Olive Tree Frog certainly has style. 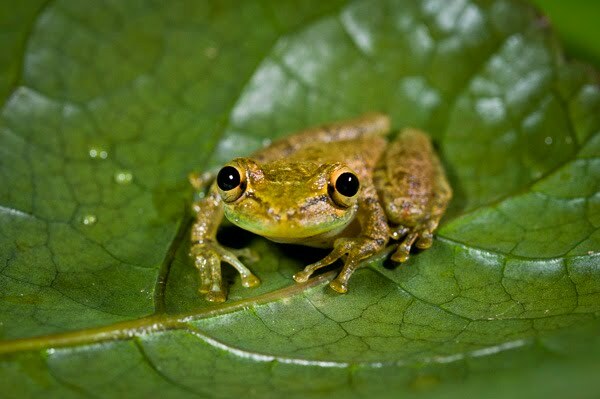 It is the most common frog found in the Caribbean lowlands of Central America below 1,000 meters. This frog lives high in the forest canopy but comes down to the ground for mating. 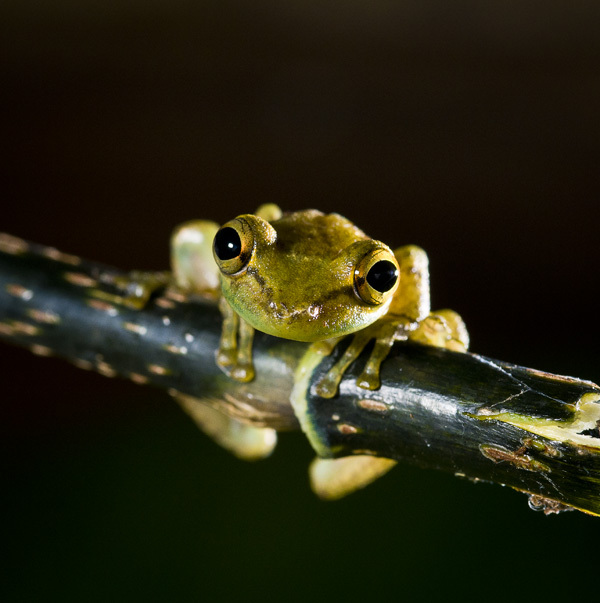 While calling out during mating season this frogs under-belly turns bright yellow and vocal sacs can turn orange. Eggs are laid in a large mass on water plants and tadpoles live between the vegetation. The unique webbing and one opposable digit on his hands and feet allow him to stay upside down and his entire body becomes suctioned to a leaf when necessary. This little tree frog was coming into our bathroom at night. I would see him in the early morning but he would disappear before we could get our hands on him. So when the power went out for two days he started feeling comfortable in the dark and we got him! Barry set up a little froggy eden right underneath his lens and this is one of these are the images he made. So little and so cute. He kept jumping on Barry. He was leaping at least 3 feet in a single bound. The pads of his feet are very sticky. He can walk upside down for a very long time. that we have had several different opportunities to study them and looks for variations in each one. The following images are from a different olive tree frog on a different day. I want the silhouetted frog as a poster! And as an opaque glass decal, too. Where?! We are making you one now. I will post the link here and send it to your e-mail when it is complete!